This is a coastal chart that covers the area from the Thames estuary as far north as the Humber. It dates from 1584 and was drawn by the mariner Richard Poulter. It provides a detailed description of the sands. The differing stability of the banks are indicated by red and black dots. 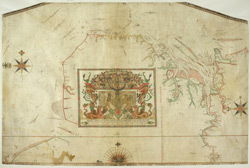 The chart is embellished with the Royal arms and the Tudor rose forms the centre of the compass. The standard of draughtsmanship and the decorative elements reveal that this chart was for use in the study rather than on board ship. The chart is covered in numbers which are notes of depths and anchorages. Rather than to aid navigation these are actually to provide essential information about which areas are most likely to be chosen for enemy landings. The detailed nature of the chart highlights how many advances in knowledge are owed to the impetus of war, defence and attack. This chart was produced at a time of intense hostility between England and Spain. Raids on transatlantic shipping by English seamen such as Francis Drake and England’s support of the Protestant rebellion in the Spanish ruled Netherlands had induced the Catholic Philip II to plan an invasion of England. This threat culminated in the defeat of the Spanish Armada by the English in 1588.